Colorado’s magnificent scenery can be found almost anywhere in the state, from Denver highways to grocery store parking lots. But some would argue that the true Rocky Mountain experience is hidden in hard-to-reach spots among the peaks. But visiting the state’s less explored sites can be complicated, challenging and intimidating for novices. If you can even figure out where to go. There are thousands of trails in Colorado to choose from, with a wide range of lengths, difficulty ratings, pros and challenges. Set yourself up for success in Colorado’s backcountry with these backpacking tips for beginners. The right gear is imperative, starting with the pack. Talk to the experts at REI or your local outdoors store for tips on finding the right-sized pack, style and fit. Try on several brands and styles before making an investment. Backpacks can be expensive, but you don’t have to drop a fortune to get the right one. After comparing packs in the store, buy a used one from one of the state’s many outdoor enthusiasts looking to unload their gear. You can find used hiking gear in consignment sports stores, in an online marketplace (like Craigslist or Facebook's market) or even yard sales. New isn’t always better. Comfort is key no matter how old, used or affordable the pack. Sometimes a used pack can fit better because it's been broken in. Make sure it is in good condition, with working straps and no holes. Besides the backpack, consider the size and weight of larger items, like a sleeping pad and sleeping bag, to maximize available storage space and lighten the load. Even with the newest lightweight gear, an overloaded pack can distract from your backpacking experience. Plan to wear the same clothes for a couple days. Cut back on unnecessary garments to make room for essentials, like rain gear to combat afternoon showers, and dress in layers to keep you warm as temperatures drop at higher elevations. If you’re climbing in altitude, pack plenty of water and snacks loaded with electrolytes to combat altitude sickness. Be logical about what you bring, but don’t forget to leave room for a treat. A can of beer, a candy bar or a deck of cards won’t take up much space and make great rewards when you stop for the night. Colorado is full of surprises, from stunning views to unexpected weather. Limit unwelcome surprises and build confidence before your next backpacking trip with a test run or two. Practice hiking with your pack. Day hikes are a great way to get your feet under you, test your gear and get comfortable before you are too deep in the wilderness to back out. Find a trail in the mountains or a leisurely stroll through the park for a trial run. The Deer Creek Canyon loop in Jefferson County is an easy, 2.7-mile hike for a longer, two-hour test run of your gear. Take your time. Spend the day making adjustments to your pack and gear to find the most comfortable fit. Don’t turn around at the first sign of bad weather. Throw on your rain gear or some extra layers and keep trudging along. It’s good practice for the real deal. Of course, be smart. Especially if you are hiking at higher elevations, where lightning could be a danger. Colorado’s extensive trail systems offer endless backpacking destinations from beginner to expert level trails. State and national parks are a great place to start your backpacking adventure, where rangers offer in-depth advice on the difficulty of trails, water sources and campsite locations that can help you determine the best route. 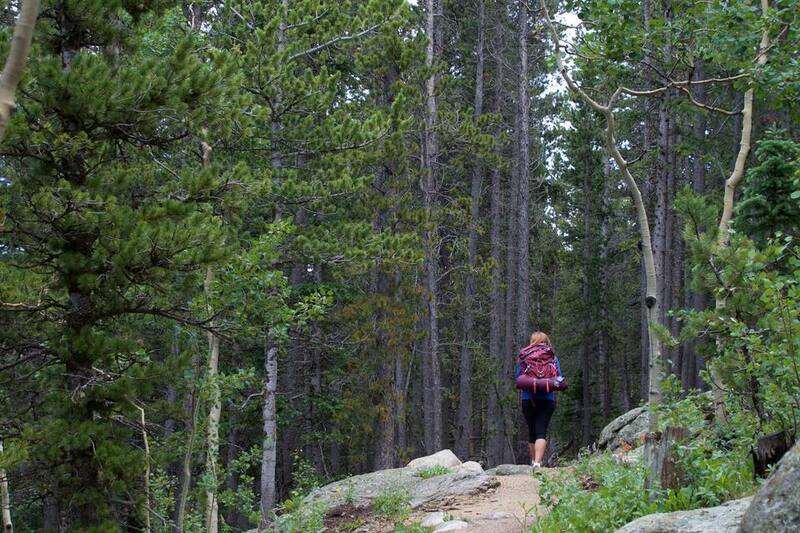 Check out the trails at Golden Gate Canyon State Park about 14 miles northwest of Golden. Easy, moderate and difficult trails throughout the park lead to designated camp spots that have to be reserved and paid for at the visitor center beforehand. The Horseshoe Trail takes hikers 1.8 moderate miles to a backcountry shelter big enough to fit a backpacking tent in, which offers three-sided protection from unexpected weather. Several trailheads near Bailey, about 45 miles southwest of Denver, offer less-traveled trails with free, dispersed camping along the way. Backpacking is for everyone, Hoppes said. Don’t let the conquests of other outdoor enthusiasts deter you. Whether you’re picking a pack or the location for your trip, stay focused on what works for you.